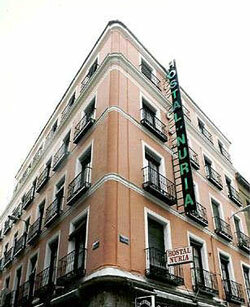 Hostal Nuria in Madrid, Spain. Family run hostal located right in the heart of Madrid, close to attractions, restaurants, shopping and more. Most of our rooms have private facilities and air conditioning. Over 50 private rooms, with heat, telephone, TV and air conditioning in most of them as well. Also, there are plenty of more services you may enjoy, such as restaurant, cafeteria, safe deposits, checkroom office, tourist information... And all in a family like environment. Services: Heater in every room, Air conditioning in almost every room, T.V. in every rooms, Telephone in every rooms, Safe, Reception open 24 hours, Elevator/Lift, Restaurant on premises. Several languages spoken. Location: The hostel is just a three minute walk from Gran Vía and five minute walk from Puerta del Sol. The nearest Metro stations are Tribunal (lines 1 and 10) and Gran Vía (line 5). The closest car park is located on Barceló street, just 50 m from the hostel.